What Happened to Book Publishing in Brazil? 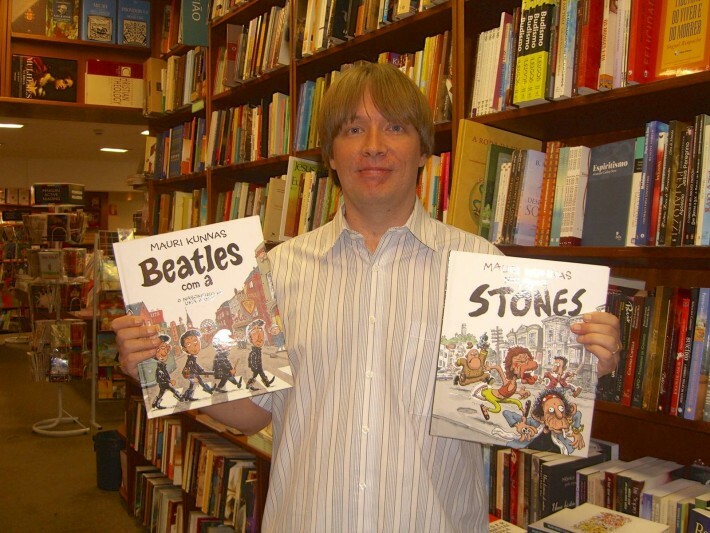 Pasi Loman, pictured at book launch in Brazil in March, holding translations of Beatles and Rolling Stones comic books by the Finnish living legend, Mauri Kunnas (7 million books sold). The strong US dollar, a struggling bookstore sector, and a slowdown in government book acquisitions has pushed Brazil’s book publishing sector into a crisis. Over the past few years, professionals at international book fairs have enthused about the booming Brazilian publishing market. Brazil has been the guest of honor at Frankfurt, Bologna, Gothenburg, and Paris, among other book fairs. Stories of incredible six-figure deals negotiated in double-quick time and of sales figures in the hundreds of thousands or even millions of copies were being bandied about in cafés and offices, from New York to Oslo and beyond. Ominously, however, it seems that at the London Book Fair this year, it was Spanish-speaking Latin America that was causing a stir amongst agents and publishers, rather than Brazil. Moreover, the forthcoming Frankfurt Book Fair/Publishing Perspectives event, The Markets 2015 — covering seven important book markets, has favored Mexico over Brazil in representing the region. And truth be told, those of us working in book publishing in Brazil frequently get asked nowadays why aren’t we getting as many or as good deals as we used to. Well, book publishing in Brazil hasn’t completely stopped. Deals are still being made, books are being published, bought and read, but the situation has certainly changed from just a few months ago. It has become increasingly difficult even for big international bestsellers to find a good Brazilian publisher and/or to negotiate advance payments as high as some authors might expect. One reason for this is the change in the currency exchange rates. The exchange rate for the US dollar has gone from around two Brazilian reais (BRL) to well over three, reaching as high as 3.27. At the time of writing this, it’s still above 3. Of course this doesn’t mean that publishers have stopped buying rights altogether, but for the time being, publishers are more cautious and the advances offered are lower than before, as Jorge Oakim and Otávio Marques da Costa, the publishers of Intrínseca and Companhia das Letras respectively, recently told the O Globo newspaper. If even Intrínseca, which regularly tops the bestseller list and sold over 5.5 million copies of Fifty Shades of Grey, is having to be more prudent about acquisitions, spare a thought for those publishers whose books normally sell only a couple thousand copies each — which is the Brazilian norm. Nevermind the high exchange rate for the dollar — or the weakening of the real. Brazilian publishers are also being squeezed hard by various internal problems. The bookstore sector is struggling. It has been reported, for example, that Saraiva, Brazil’s largest bookstore chain, has let go a significant number of employees, and there are unconfirmed rumors of many more lay-offs to follow in the bookstore sector. One mid-sized publisher told me off the record that one of the country’s biggest online retailers has owed them a significant six-figure sum for months now and that this has been seriously undermining their own operations, forcing them to re-think their already planned publications for this year and the next. Why? Unlike other markets, it’s not because of ebooks that the brick-and-mortar bookstores are struggling. Indeed, ebooks have not really taken off in such a ways as to make any meaningful difference in Brazil just yet. What has been worrying is that the all-important governmental book buying programs, in which the federal and the state governments purchase books for schools and libraries, have been put on hold and payments for books acquired are late. Rumors abound that this year’s programs may be cancelled altogether. Given that these government programs make up 37% of all book sales in Brazil, and even more so when it comes to children’s literature, this is causing a major headache and sowing fear among the publishers. There have also been cuts and lay-offs at the Biblioteca Nacional, which, among other things is responsible for translation and travel grants for foreign publishers and national authors respectively. Not surprisingly, therefore, there are reports of payments of approved translations grants being late and of deadlines for new grants being moved forward. Another example of the current crisis is that some literary awards have not been paid out to their winners, as is the case for the US$13,000 prize that accompanies the O Prêmio Paraná de Literatura. And another very bleak statistic is that that according to a recent survey, 70% of Brazilians didn’t read a single book last year. As a consequence of these many factors, it has become more and more difficult for foreign agents and publishers to receive payments for agreed deals, and even royalties earned, in a timely manner. In defense of the Brazilian publishers, it is my experience that they always eventually honor their financial commitments, it’s just that the payments which in the past were made on time, or only a few days or weeks late, are now being paid months after agreed upon dates as a result of the serious cash flow problems. Listing out problems is easy. It’s much harder, however, to identify the catalysts for this sudden downturn in Brazil’s book publishing sector. The best I can offer is to point to the current political and economic turbulence in Brazil. Millions of people have marched on the streets demanding for president Dilma’s impeachment for alleged corruption. The IMF estimates that Brazil’s economy will shrink by 1% in 2015. So Brazil is clearly no longer the poster boy of the BRIC nations. And given the fact that books are still something of a luxury product in Brazil — when visiting the Lillehammer Literary Festival in Norway in 2013, I made the comparison that if you compare the national average salaries and the average book prices of the two countries, books are three times more expensive in Brazil than in Norway – any problems in the wider economy are, therefore, bound to have an effect on the publishing industry. Despite all the current challenges and bleak short-term forecasts, I continue to be optimistic about book publishing in Brazil in the medium- to long-term. Moreover, innovation, hard work, and creative thinking can still bring you results. I, together with Bonnier Rights, for example, negotiated a somewhat surprising eight-book deal for the highly regarded Swedish poet (yes, poet!) Bruno K. Öijer. And in what for many may have seemed like a curious move, Sextante, one of Brazil’s top publishers, brought adult coloring books to the market — something they seem to have been richly rewarded for, as two of these books occupy several top slots on the bestseller list. So, as is often the case in publishing, publishing “more of the same” may be difficult at the moment, but new things, well marketed, can work very well. Brazil’s boom may be over, but it’s not quite a bust yet. We hope for and expect a turnaround sometime in the near future, but it will probably depend on the general situation in Brazil improving first. Pasi Loman is the co-founder of the Vikings of Brazil Literary Agency, which represents Scandinavian literature in the South American marketplace. You can read more about him here.